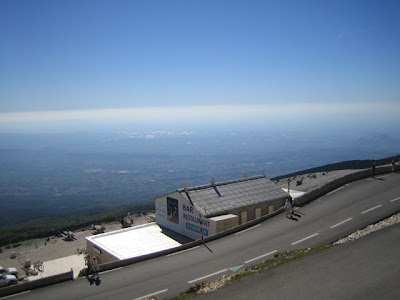 Mont Ventoux is the highest point in Provence and quite possibly the highest place, bar a skiing trip to Meribel, that I have been. Situated 20km north east of Carpentras in the Vaucluse département, it was a little way off from our usual stamping grounds of St-Remy-de-Provence and The Camargue and it took six or seven trips to the area before we visited. 1912 metres at the peak, Mistral wind speeds of 200mph have been recorded there, hence the name Ventoux which means “windy” in French. Locally nicknamed “The Bald Mountain”, the bare terrain is a memorable stage in the annual Tour de France cycle race. A website showing daily webcam conditions of the area is called Cycling on the moon. We cheated and drove up there. Although a very pleasant September day, it was very cold at the top and during winter would often be covered in snow. 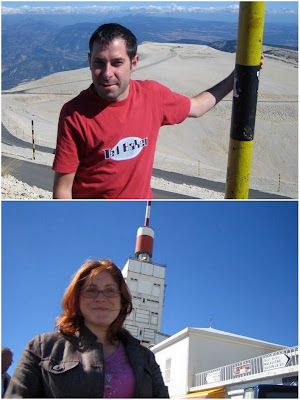 Mont Ventoux is geologically part of the Alps but has no similar size peaks around it and stands alone. The view, it goes without saying, is breathtaking.